How do you survive your new college life all by yourself now that you finally moved out of your parents’ place? Many upperclassmen like me walked your shoes and thought the same thing, What if I miss my mother’s signature dish, or what if I crave comfort food, or maybe I want that Chinese takeout near by my place or do I need to drive back home for that amazing bubble tea? Luckily, you have chosen a college that’s surrounded by incredible food places. Firstly, the campus itself has a lot of restaurant and food options available. 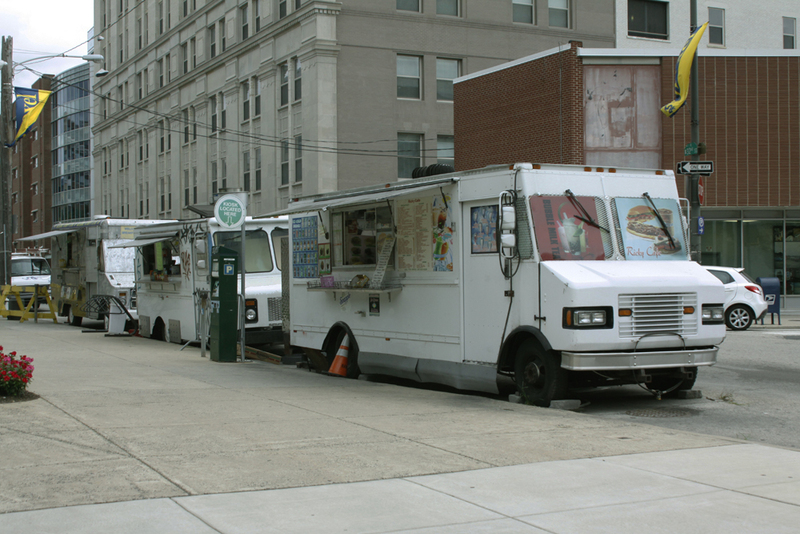 One of the first and most popular would be the halal trucks. Now you may ask which one is the best and anyone would just say find the longest line. Yeah, lines in front of food carts are long for a reason because they are good. In my opinion the trucks in front of the library are the best. If you want something quick on your way to class, the breakfast truck in front of Buckley Field is a great option. Other breakfast trucks such as H&J are also good. Be sure to visit the “food truck alley” behind the Main Building. There are a lot of trucks with variety, starting from breakfast trucks and fat sandwiches to Chinese food. However, the best would be “Cuchina.” You need to taste those chicken satay tacos and everything else they have to offer. Their Thai, Filipino and other cuisine makes up a nice fusion and they are some of the nicest guys you will meet. Just be warned that the line will be huge and all the food trucks in that alley closes after 5:30 p.m.
Apart from food trucks, you can try the pizza places on Lancaster Avenue after a long Friday or Saturday night. They are often open till 2 a.m. Blaze and Ed’s are popular choices. If that’s too far for you then Powelton has a few pizza places as well, which is really close to the dorms. There is a new Wawa coming on campus this year so that might be a great option. You might need coffee to feel better after certain nights. If you have to meet some friends, go on a date or are craving brunch, then go no further than the Rec Center. Below the Rec is one of your go-to brunch places: Landmark Americana. The food is great, the wait is not that long and the people working there are extra friendly but, that’s not even the best part. Brunch is fifty percent off for Drexel and UPenn students if you show them your ID between 11:00 a.m. and 3:00 p.m. on the weekends. If you are underage, but still want to enjoy happy hour, go no further than Sansom Street. The street also has Federal Donuts, so if you are craving sugar you know where to go. There are also great options beyond campus in the city. Green Eggs Cafe and Indy Blue in the “Gayborhood” are two fine brunch places. They always have a huge line so go early. If you are craving comfort food, then Mac Mart is a great place. Time and Coda are great bars and clubs with good food. Do remember as you go towards the city, your wallet will get lighter. A great Italian place called Pietro’s Coal Oven Pizza also can be found in Center City. It’s really cozy and classy and the atmosphere is sweet. One of my favorite dishes is the vodka penne, but they have other great dishes as well. If you take the Drexel shuttle and drop off at the city stop and make it to 10th Street, you are at the heart of Philadelphia’s Chinatown. Bonchon is a great place to get Korean food and the wings are a must try. There are some notable bubble tea shops, Vietnamese pho restaurants and an amazing crepe place called “T-swirl”. Speaking of crepes, be sure to visit the French Bistro called Creperie Beau Monde & L’etage, which is located on 6th and South streets. Philly is a place full of exciting food trucks, restaurants and cafes. There is always a new place to experience and a new source of entertainment, so it’s really hard to get bored. All you need to do is hop on the shuttle or the subway, find a place online or just explore the old fashioned way. You’ll never run out of food to eat.